The Linac Coherent Light Source (LCLS), part of the SLAC (Stanford Linear AcceleratorCenter), is a free-electron laser source (FEL) and produces synchrotron radiation of extremely high brilliance. With its radiation, a wide range of new experiments can be effected, e.g. in nonlinear X-ray physics and for single-shot imaging of nanometer structures. 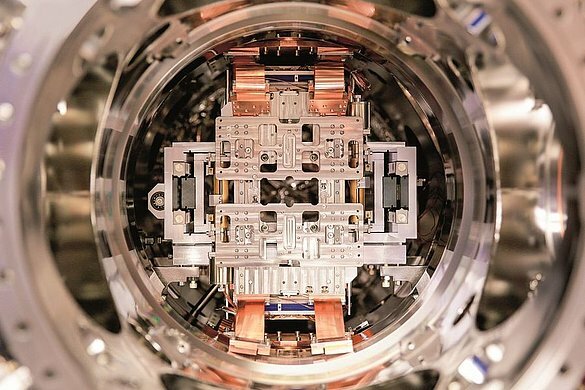 At the Atomic, Molecular & Optical Science Beamline (AMO) an experiment to give insight into the interaction of FEL synchrotron radiation with atoms, molecules and clusters is currently being set up. 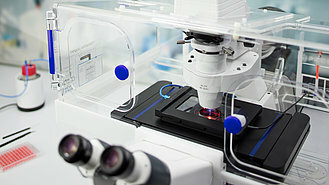 Reactions that are triggered by laser radiation in the sample are examined using electron and ion spectroscopies or X-ray diffraction. For simultaneously recording scattered X-ray photons on the one hand, and ions and electrons from the interaction of the intense X-ray pulses with the sample on the other hand, a pnCCD camera, which is highly sensitive to X-rays, has to be positioned very precisely and with highest repeatability. The camera records an entire spectrum on one pixel at very high frame rates of 1000 images per second. Due to the parallel architecture of the detector, the main laser beam can pass between the detector parts without damaging them. 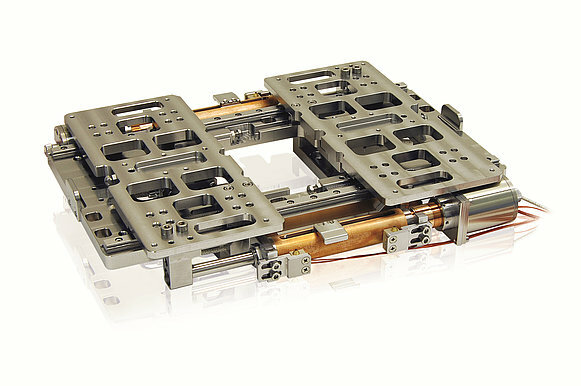 For positioning the two x-ray detectors, PI developed a compact linear translation stage that features a guiding and two separate moving plates. The detectors are able to move independently over a travel range of 50 mm heading towards the 0 "closed" position; the maximum distance between the detectors is 100 mm. 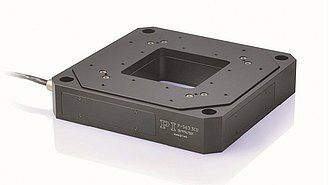 The motion of the platforms is controlled by an absolute measuring linear encoder with 50 nm resolution. When positioning both detectors accordingly, the scattered X-rays can be recorded at a wide angle range and can be evaluated spatially and spectrally. The linear stage is designed for ultra-high vacuum to 10-9 hPa and is made of stainless steel. Customer- and application-specific product developments form the basis for success at PI. To this purpose, requirements have to be understood and a technological solution has to be found.